A storm that moved through the state Friday and Saturday, leaving a light coating of snow and freezing rain, is being blamed for dozens of crashes across the state, including four that left five people dead. Police and rescuers across the state scurried to respond to the crashes. In Bowdoin, Cornville, Edinburg and Gardiner, they arrived to find those involved had been killed. Two area men died and a third was injured Saturday morning when their van crashed on ice-covered Brunswick Avenue in Gardiner. 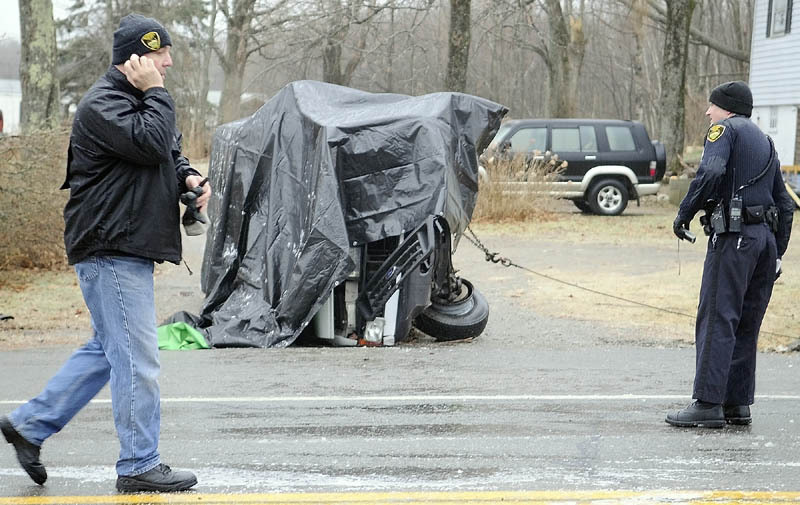 Dennis Kay, 62, of Gardiner and Carlton Norwood, 25, of Pittston, were both partially ejected when the cargo van in which they were riding skidded out of control, rolled over and landed in a ditch on its side, Gardiner Police Chief James Toman said. A third man, Thomas Bourque, 29, of Randolph, was taken by ambulance to MaineGeneral Medical Center in Augusta for treatment of injuries that were not believed to be life-threatening. Charlene Henderson, of Pittston, identified Norwood as her son and Kay as her stepfather. Bourque is Norwood’s cousin, she said. The section of Brunswick Avenue, also designated as U.S. Route 201, was closed for about three hours as police investigated the crash, Toman said. The crash occurred around 8 a.m., as the men were driving a Budget rental van south on Brunswick Avenue toward Interstate 295. Bourque was riding in the back of the van, in the cargo area. Kay and Norwood were up front in the main cabin, but police have not yet determined which of the men was driving, Toman said. “We’re still gathering facts,” he said. The van slid out of control in the area of Wingate Landscaping after freezing rain left a coating of ice on the road. “It appears due to icy road conditions and speed the driver lost control and crossed the opposite lane into the ditch,” Toman said. Kay and Norwood died at the scene, Toman said. Henderson said the three men were couriers for Budget, and that they were traveling from a rental business in Farmingdale to Windham, where they were expected to pick up Budget trucks and drive them back to Farmingdale. Maine State Police and Kennebec County sheriff’s deputies assisted Gardiner police and the Fire Department at the scene, Toman said. The crash came in the midst of a deadly 24-hour period on Maine roads. On Friday night, a 21-year-old man was killed during single-vehicle crash on West Ridge Road in Cornville. Police said weather was not a factor in that accident. The driver, Joseph T. Faucher-Kuhlman, of Cornville, was pronounced dead at the scene, according to a statement from the Somerset County Sheriff’s Office. There were no passengers. Faucher-Kuhlman was driving north on West Ridge Road in a black 2010 Chevrolet truck, Detective Lt. Carl Gottardi said in the written release. About 11:10 p.m., the truck left the roadway, then struck a utility pole and a small utility trailer that was parked in a private driveway. The exact cause of the accident is still under investigation, Gottardi said. In Bowdoin, the lone male occupant of a car that went off Augusta Road died Saturday when the car struck a tree. The victim was Andrew J. Klaiber, 45, of Topsham, according to the Sagadahoc County Sheriff’s Office. Klaiber was driving a 2005 Chevrolet Blazer SUV south on the road, which also is U.S. Route 201, and he lost control of it on an embankment shortly before 2:30 p.m. While the highway had been icy earlier in the day, police said road conditions also do not appear to have been a factor in that crash, nor were speed or alcohol. Witnesses following the vehicle reported it moving erratically before the crash, police said. The accident is under investigation. Also, an elderly woman died after a crash Saturday afternoon in the northbound lane of Interstate 95 near mile 213 in the Penobscot County town Edinburg. Details were unavailable. Police on Saturday responded to a number of other less serious crashes throughout central Maine, most of which caused only injuries. A family driving on Route 3 in Augusta escaped injury when their car slid on ice and rolled over, Dubois said. In Fairfield, a two-vehicle collision late Saturday morning on U.S. Route 201 left one of the vehicles split in half and injured that vehicle’s driver severely. 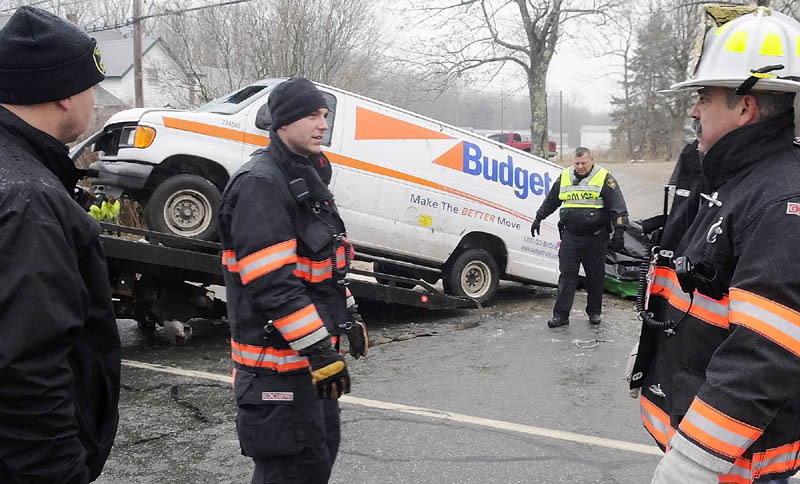 The ice also caused problems in the southern part of the state, where about 70 gallons of fuel spilled onto Route 9 at Middle Road in Falmouth when a box truck slid off the road into a utility pole about 8:45 a.m.
Falmouth Police said the pole cut the fuel tank, causing the spill. Police said no one was hurt and traffic continued to move through the area. Meanwhile, state police were responding to dozens of other traffic accidents around the region. A three-car crash was reported shortly after 8:30 a.m. on Route 109 in Acton and vehicles had slipped of roadways on U.S. Route 1 in West Bath and Route 5 in Waterboro. In several places in York and Penobscot counties, officials responded to overturned vehicles. Brunswick police said they responded to numerous traffic accidents and pedestrians injured in falls on the ice, but there were no serious injuries. Speed limits were reduced to 45 mph on the Maine Turnpike from Kittery to Augusta. Maine Sunday Telegram reporter Beth Quimby contributed to this report.